Welcome to It's Gravy Not Sauce! We invite you to browse through our store or visit us at an event. Create an account with us if you like, or shop as a guest. Either way, your shopping cart will be active until you leave the store. My name is Linnie (Linda). My father passed away 6 years ago. He called it "GRAVY, not sauce" "Macaroni" not pasta! When he passed John and I came up with "It's Gravy, Not Sauce" in remembrance of those Sunday Dinners. It is Trademarked, and we have other sayings on our line that also came from my father, Petey. We know some of our friends and family call is sauce, and it's fine by us! 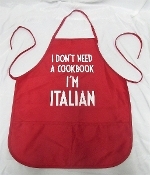 We are happy to know you support us and "Hey, It's all Italian!" How much more awesome can that get? WE KNOW OUR DAD, PETEY, IS SMILING UPON US!! !